In your cat's mind, the garden makes a perfect outdoor litter box. Cat "manure" is dangerous for the gardener. 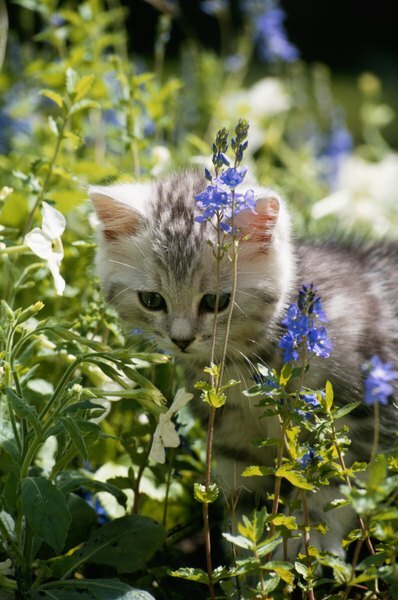 Though there's not much harm done to the soil chemistry if your garden becomes your cat's bathroom, cat poop can contaminate soil with disease. So don't leave it in your garden. Cat droppings aren't much different from cattle excrement. It contains nitrogen, phosphate and potash, which are all primary ingredients of organic fertilizers. It doesn't have exactly the same composition as cow manure, though. Cat poop has more than twice as much nitrogen, the same amount of phosphate and about half as much potash as the same amount of manure from cattle, according to University of Minnesota Extension. The health risks of cat poop outweigh its utility, though; it's not safe to leave in the garden. even if your cat is completely healthy. Never forget to wear your gloves when you work on your garden. If your cat decided to fertilize your garden himself, you could end up with more than just dirty hands by the end of the day. Cat excrement can deposit infections diseases, such as the toxoplasmosis protozoa. These organisms are different from bacteria and viruses, but they can still make you sick. It's possible to catch roundworms if you touch your mouth to contaminated soil, according to Washington State University Extension. Equip yourself with thick gloves and a digging tool before setting out to remove cat poop from your garden. Bring a disposable bag or bin to deposit the droppings in. Dig up an inch or 2 of the soil beneath it as well, just to make sure you got it all, and put it in the bag. If you use a plastic bag, double it with another bag to make sure it's sealed. Throw away cat excrement and dirty litter; don't compost or burn it. Clean the shovel or spade with a detergent solution before you bring it back into action. Mangled lettuce, uprooted carrots and broken tomato stems are signs that your garden was ravaged by a feline invader. Chances are the cat wasn't there for the plants, though; it was the wonderful soil he wanted. Luckily, a few means exist to keep kitties out. Planting rue near your garden is one method. Cats hate the smell created by rue leaves and will go out of their way to avoid it, according to University of Vermont Extension. Rose bushes are also an effective deterrent. You could surround the garden with a fence or chicken wire. Growing catnip in another part of the yard is a good cat diversion, too.